NYS Unity Caucus, of course, is the one that's behind Revive NYSUT. This is the Caucus that promised to oppose Common Core and Cuomo. Yet Karen Magee, pictured at left, offered the logical fallacy that it was CCSS or chaos at an AFT convention. That's called a black and white fallacy, insinuating that there are only two possiblities when there are, in fact, many more. Another Revive lie, also in the picture, was its claim to be against Cuomo. Revive/ Unity failed to oppose him not only in two primaries featuring the incredible Zephyr Teachout, but also in the general election. 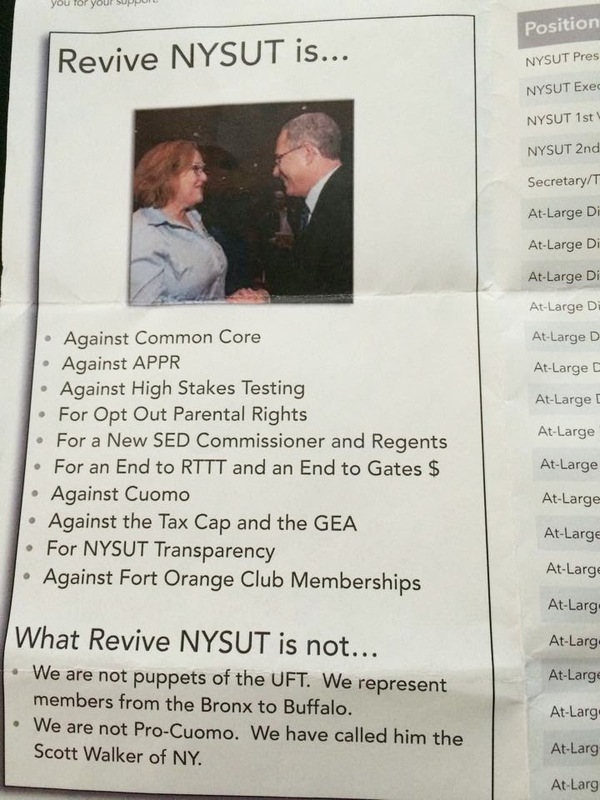 Revive was a coup in NYSUT that was supported by Michael Mulgrew and his loyalty oath signing UFT Unity Caucus. UFT is by far the largest group in NYSUT and is pretty much the tail that wags the dog. It is with great regret that we feel compelled to respond to a recent yet familiar rant by Beth Dimino, Chair of the Stronger Together Caucus and President of the Port Jefferson Station Teachers Association on Facebook. First of all, this is classic passive aggressiveness. We're sorry, but.... Everyone knows that once you say "but," you can disregard everything that's come before it. If they regretted it so much they would not say it. A claim like that is plainly disingenuous. The UNITY Caucus has taken the high road for a year and a half but eventually, enough is enough. I'm not particularly sure what the high road is for Unity Caucus. This smells like the same writer who did a similar hatchet job on me, full of nonsensical strawman assertions. In fact, AFT President Randi Weingarten thought that was just fine, and linked to it on Twitter. She removed the link after I pointed out that the writer, by falsely calling me a part time teacher and part time unionist, managed to insult not only me, but also every UFT chapter leader in the city. By publicly encouraging others to defund VOTE-COPE on Facebook, “Go into school tomorrow and reduce your VOTE-COPE contributions to $0.00!” she is feeding conservative legislators the ammunition they need to pull our union apart. First of all, it wasn't Beth Dimino who gave tens of thousands of dollars to Senator Flanagan, who has helped enable the reforminess now making NYSUT members miserable statewide. It wasn't Beth Dimino who supported Senator Serphin Maltese, who helped break two Catholic school unions. Nor was it Beth Dimino who supported George Pataki, who thanked us by vetoing improvements to the Taylor Law. No, that was our COPE money. Some might say she should consider joining in with the Koch brothers and other right winged-politicians if her goal is to kill the union. Let's be clear--this writer just said that, while attempting to sugar-coat the statement with "Some might say." Let's further examine the logical fallacy inherent in this sentence. Obviously, there's that strawman. Beth Dimino is one of the most passionate unionists I've ever met. The notion that she wants to kill union is preposterous, a pure concoction of the Unity writer. Secondly, by invoking the Koch Brothers, there's guilt by association, another logical fallacy. Let's be further clear that there is a movement to kill union and it is in no way supported by Beth Dimino. It is enabled, however, by our history of concession to reforminess. Look at the UFT 2005 Contract. Look at Michael Mulgrew helping to craft the APPR law. Look at him praising the Heavy Hearts legislature for making it worse. Look at Bill Gates addressing the AFT Convention. And those are just a few of the low lights. When you cannot muster a proactive argument, logical fallacy is one way to go. What's truly pathetic is that this is what our leadership chooses to put forth as their voice. Among teachers, there are quite a few thinkers, quite a few creative and passionate souls. Judging from what passes for argument among leadership, and how they choose to treat people who speak their minds, they haven't got the remotest notion what a creative and passionate thinker even is. Related: PJSTA defends its President.